The numbers have been crunched from our on-line reporting system and 64 TreeSteward members reported 3300+ service hours in calendar year 2013. More importantly, we provided education over 5,000 times and worked directly with trees 4,000 times. For statisticians reading this, that’s duplicated counts in that one TreeSteward may have watered the same 10 trees 4 times throughout the late summer drought (trees want duplicated watering!). 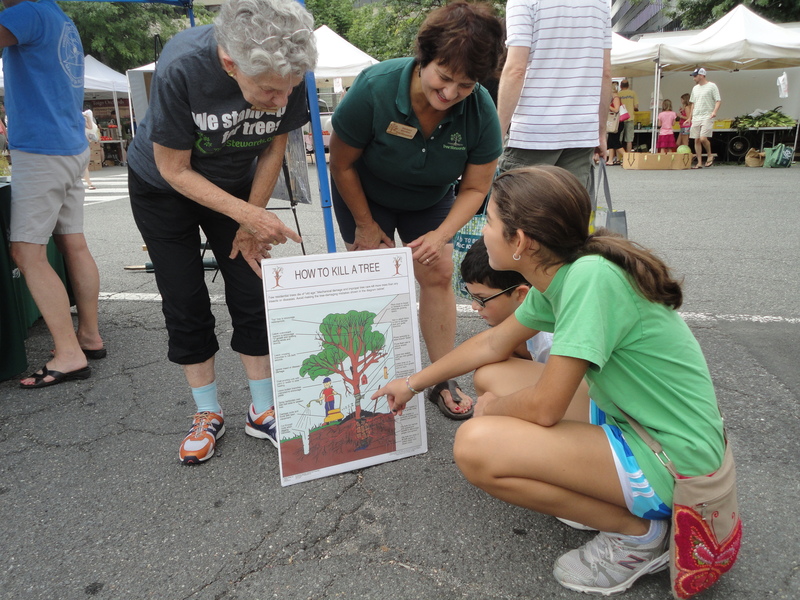 We provided tree care information to residents at the Parkfairfax Native Plant Sale, Alexandria Earth Day, Farmers’ Markets at Courthouse, Westover, Falls Church,Del Ray. Tree Stewards provided individual education to more than 400 families who “adopted” tree whips at the fall Tree Distribution Program. TreeStewards participated in Arlington County’s Notable Tree Program with the result that 17 new specimen trees received recognition by the County Board. Neighborhood participation by TreeStewards resulted in six being put on their HOA Boards or greens committee, others wrote articles for community newsletters, and coordinated for the Tree Canopy Fund. TreeStewards enjoy providing education at community events. Over 12,000 Visitors had 25,236 Views to this website with information on tree care and advocacy for trees. “Take Ivy off Trees” had 900 viewers and groups from around the nation requested permission to use materials or link to our site. In Alexandria, Alliance for Community Trees and TD Bank partnered with us to plant 30 trees at Tarleton Park and provided funding to purchase equipment for ongoing projects. Watering of the trees is funded for two summers as well. 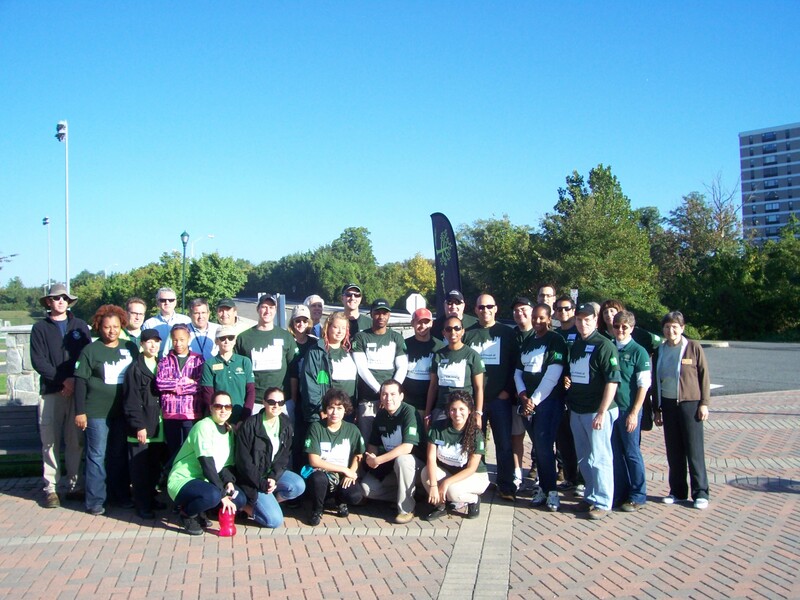 Casey Trees partnered with us to plant another 25 trees at Four Mile Run Park. 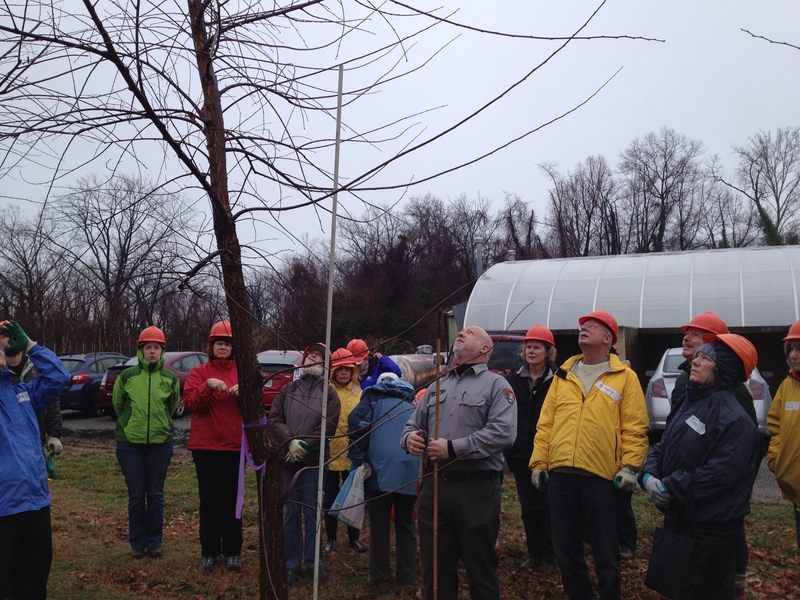 In Falls Church, TreeSteward members assisted at three weekends of tree planting. In Arlington, twelve members worked through the Arlington Tree Canopy Fund and assisted homeowners and associations in selecting the Right Tree for the Right Place for 400 trees. Habitat restoration by removing invasive plants and planting natives was a core volunteer effort that occurred in each jurisdiction. TreeStewards serve on Urban Forestry Commission in Arlington and Tree Commission in Falls Church to advise local governments on tree related issues. A tree census was conducted of forested land beside the W&OD Trail in an effort to preserve the 170 native trees present, with the results circulated at public meetings. Meetings were held with VDOT officials to increase the use of native trees along roadways. TreeStewards increased their knowledge through participation at the Quarterly Urban Forestry Roundtables on urban watersheds and tree production, pruning practicum with Arlington County staff, a tree walk at the US Capitol with Alexandria arborist, and tree root exploration with Falls Church arborist. This year Casey Trees kindly invited us to their trainings. Casey Trees included us in their pruning workshop taught by Barry Stohl, NPS. And now we are training 21 new members to increase our presence in 2014! This entry was posted in Community Service, Events, Uncategorized and tagged annual report, volunteering. Bookmark the permalink.